Are some of your clients too shy to try nail art? Fear not. We rounded up a few nail artists and asked them to come up with simple designs that are big on subtlety and short on flashiness. Take inspiration from their work and start turning your French and polish-only clients into nail art patrons. Some clients are game to try anything. Mention a new service and they quickly book an appointment, eager to try it. Then you have the shy types, clients who come to you regularly for the same service, never thinking of venturing into new territory. All the want is their standard pink-and-whites, no wild, flashy nail art for them, thank you. Now’s the time to coax meek clients into trying something new---nail art to be precise. 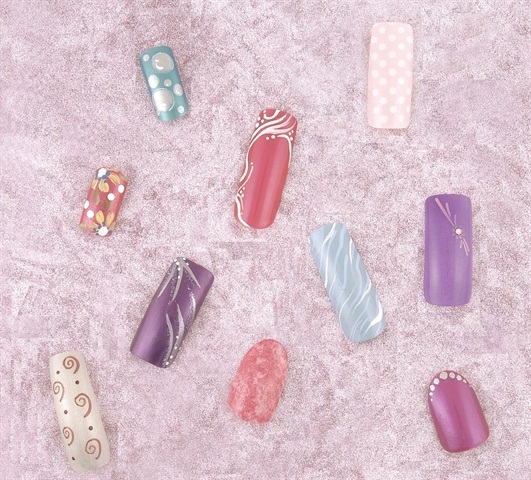 Nail art, after all, is a popular service, offered in 74.3% of salons, according to NAILS’ 2003-2004 Big Book. 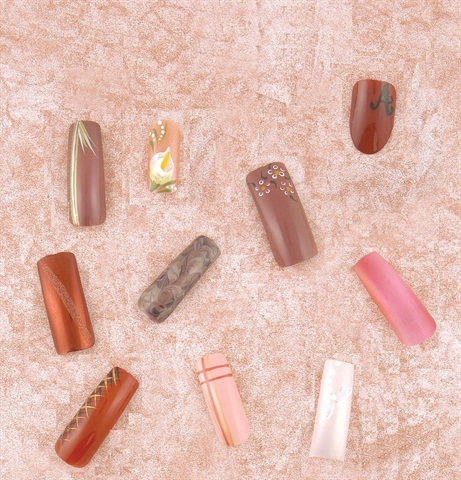 Whether you opt for airbrushed or handpainted designs, you can create beautiful, subtle, and elegant creations that will surely turn a hesitant client into a nail art lover. We commissioned several nail artists to create subtle handpainted and airbrushed designs that are perfect for the shy, quiet types. These designs are sure to coax your clients out of their shells. Some nail technicians protest that their clients would never wear nail art---they’re just too conservative, it wouldn’t fit their professional image, nail art is too wild. Does this sound familiar? The truth is, nail art is only as wild as you make it. Most people associate nail art with colourful and sometimes wild designs, but the truth is marbleized polish, a single stripe, and a rhinestone or two all count as nail art. Making the sale is up to you. Don’t wait for a client to ask you for nail art. You are your best advertisement. Here are some ways you can convince even the shyest client to take a little walk on the wild side and try some nail art. Wear your own designs. Prospective clients will notice and ask who does your nails. Hold an open house. Every few months, invite clients to come in and try something they haven’t before. That’s your cue to suggest they try an airbrushed or handpainted design. Put your art on display. Have a portfolio of your work on hand for clients to browse through. A portfolio will help open their eyes to the endless nail art possibilities. Give them tips. We’re not talking about money. 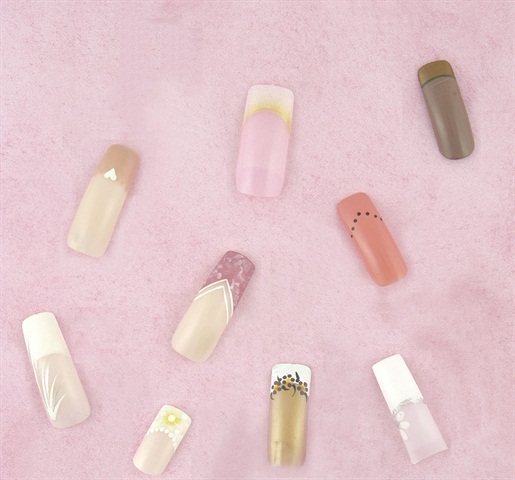 Do your nail art designs on nail tips and place them at your nail station. Show a range of designs, from soft and subtle to wild and flamboyant. Cash in on trends. Stay up to date on the latest styles and fashions and incorporate them into nail art designs. If your clients know you’re doing something a little out of the ordinary they might pay more close attention to what you have to offer. Just suggest it. If you’re feeling especially forward, ask your client if she’d like to try a design that day. This works especially great if she’s attending a big event and wants her nails to stand out. Hold nail art promotions. Give one complimentary design with a manicure or handpaint a design on a big toe with each pedicure. You can also run a weekly or monthly promotion on a particular nail art design. Show off your winnings. Display any nail art trophies or certificates you have and use it as a conversation starter to sell your art. These nails are perfectly suited for fans of the French look. The best thing is you’re not straying from the traditional; you’re simply adding a twist to a classic. Gina Morgan, a nail tech based in Oakdale, Calif, handpainted this heartfelt design. She polished the tip in a peachy pink shade and added a white heart in the middle of the smile line, along with dark pink dots. Pink-and-white nails can be airbrushed too. Take it from Ellen Torchia of Beauty Airbrushing in North Bend, Wash, who did this look. She airbrushed gold paint at the smile line. Kristina Baune of Ultimate Imagge in Redwood Falls, Minn, created a dramatic looking French nail, perfect for nighttime (or anytime). She used a combination of bronze, plum, and blue-green colors to create the look. For this handpainted design, Morgan added a touch of color to a chevron nail. She combined pink and white polish to create a swirled look on the tip. Baune used hot pink and black to create this whimsical handpainted look. She added a black dotted line in place of an actual chevron. Morgan used white and silver for this handpainted design. She added white and silver stripes along one of the sidewalls, giving the nail a retro look. Andrea Van Luchene of The Nail Studio in Gaylord, Mich, handpainted a pale yellow flower and white dots on the free edge of the nail for a pretty variation on the classic pink-and-white look. Torchia handpainted this flowery design. She used gold polish on the nail and white on the tip. She then added three small flowers along the smile line. Adela Munoz of Sweet Af-Hair in Cucamonga, Calif, takes white to new heights with this handpainted design. She added a white flower below the smile line and silver glitter along the smile line for an extra dose of shimmer. If your client absolutely loves wearing polish, keep applying it, but add a little something extra on the nail, or maybe even suggest airbrushing a color on the entire nail. All you need is a little stripe here, some marbling there and viola, you have nail art at your fingertips. Angi Wingle of Etters, Pa, created this “Laverne and Shirley” esque personalized nail. She used a wine-colored polish as her base and used black for the letter “A”. Morgan used a plumy shade of polish on the entire nail then added silver and gold stripes for a simple yet elegant look. Flowers are always popular nail art choices and Van Luchene is no stranger to that. She added a calla lily to the nail, which she first polished in a shimmery pink shade. Torchia added three small flowers in the top right-hand corner of this plum-colored nail for a decidedly feminine look. This nail by Torchia oozes simple glamour. She polished the nail in a red wine shade and added wine glitter diagonally down the middle. For this fun nail, Morgan swirled a dark, grape-colored polish with a mauve shade. The result is a retro-looking nail that’s simple to recreate. Dianne D’Agnolo of Too Much fun airbrushed this hot pink nail using several colors to create the blended final look. The crisscrosses on this wine-red nail by Morgan add extra drama to the design. Baune gives this pretty in pink nail an extra punch by adding multi-colored stripes. Munoz polished this nail a soft pink, then used white to create a dragonfly. She added silver glitter to its wings and body. Some clients may shy away from wearing nail art on their hands, especially designs that feature bright colors, but they’ll give it a go if you apply one of these bolder designs on their tootsies. Van Luchene used turquoise and shades of silver and white to create this bubbly design. D’Agnolo airbrushed the nail in a baby pink shade then added white polka dots. Van Luchene used a dark pink shade of polish as her canvas for these pretty daisies. D’ Angolo polished the nail in a vibrant pink shade then added white lines along the sidewall and free edge. Here, Torchia also used purple, except this time she airbrushed the nail. She added a tiny rhinestone in one corner for fun. This nail by Torchia has an almost regal look to it. She used dark purple polish and added stripes and dots along the top and bottom of the nail. D’Angolo’s handpainted design evokes images of the sea with its baby blue background and strokes of white. Morgan adds spirit to basic white by adding fun swirls and dots to the nail creating a whimsical feel. On this nail, Wingle opted for a marbleized look, using pinks and whites. The simple design works well for art-shy clients. Wingle gives this nail a jolt of color by using a pretty fuchsia shade. She topped it off with silver dots along the free edge of the nail.